This one hour long fitness session will have your hen feeling the burn in more ways than one! 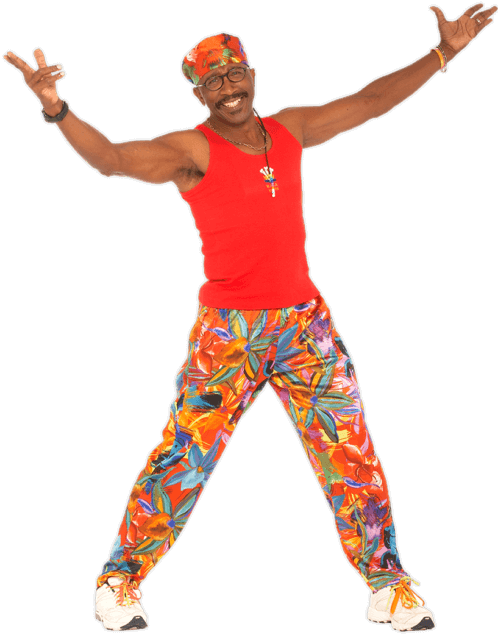 She’ll be put through her paces by our professional fitness instructor who’ll have her doing ridiculous stretches and sprints while wearing his hilarious Mr Motivator outfit! All this takes place at midday in the city centre so your hen will be burning with embarrassment too! All the equipment you need is provided – skipping ropes etc and a free pink wig for the hen. This is laugh-a-minute hen party fun that your whole party can get involved in. Get ready to get fit in fits of giggles, ladies, if nothing else you’ll certainly work your laughter muscles! 1. It’s unique: This is one hen party activity that’s not the norm. Forget the usual L plates and forfeits, a personal fitness instructor dragging you round town in silly costumes and putting you through your paces is one hen do activity you’ll never forget! 2. Embarrassment: Want to totally embarrass your hen? Of course you do! With a personal fitness instructor you’re guaranteed maximum laughs at the bride’s expense. She’s never going to live down those terrible squats and how ridiculous she looks doing star jumps in the centre of town! 3. Stay fit even on a hen party: All the embarrassment and laughs aside, you could actually take the exercise part of this activity seriously and use the opportunity to ramp up your fitness regime. Our professional personal instructor knows all there is to know about fitness, so get ready to learn something new. Your personal instructor will have you running through the streets, dropping for press-ups and doing lunges right there in the city centre. This is one activity with a strict outdoors policy. For maximum embarrassment you and your hens will be going through boot camp in the open air in front of as many people as possible!